Terrorism is, as defined by Eric Cartman, when one uses fear to get what you want. This is a favorite tool of religious extremists of both the Muslim and Christian varieties, who try to use it to get their demands met. Most notable among these are Al Qaeda, the group that caused the September 11th terrorist attack in New York City, lead by Osama bin Laden, and Vladimir Stolfsky's crew, who are employed by the British Government to overthrow the United States. Despite numerous attacks, Al Qaeda was finally destroyed when they teamed up with the United States against the New Jersey invasion... and the United States took out their leader, Osama bin Laden. The newest terrorist group on the block, ISIS (the Islamic State of Iraq and Syria) decided to take advantage of the Washington Redskins crowd-funding company, until they decided the group was offensive. The Ginger Sepratist Movement is also considered a terrorist organization. They are a fairly generic, if powerful enemy, showing up to attack the player and being extremely difficult to defeat. The Pee-Tron tower works best on them. 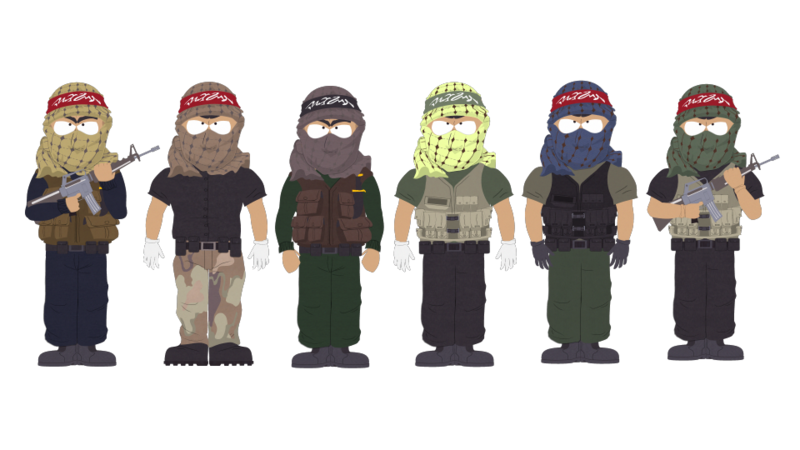 Various terrorist organizations have appeared in South Park's history, most notably Al-Qaeda, the group that caused the September 11th terrorist attacks, but as they all serve a largely identical role they are all featured here. By Season Eighteen, a new terrorist group called ISIS largely took over Al Qaeda's niche in promoting radical Islam and advocating violence against the United States. They appeared notably in "Go Fund Yourself".